Classics Ireland is a peer-reviewed, Dublin-based journal for the study of the ancient world, in particular ancient Greece and Rome and their modern legacy. It is published by the Classical Association of Ireland, which was founded in 1908. Classics Ireland has been published annually since 1994. It publishes articles on all aspects of the ancient world, though it maintains a particular focus on articles on the classical tradition in Ireland and the Celtic world. Submissions of both academic and general interest are welcome. Contributions are welcome on all aspects of the language, history, archaeology, and literature of Greek and Roman antiquity, especially if there is an Irish dimension. Contributions should to be scholarly, but not technical. All Greek and Latin must be translated. Minimal footnotes are preferred. Articles should not normally exceed 5,000 words and will be independently refereed before formal acceptance for publication. Copyright remains with the author. Authors will receive one copy of the journal in which their article appears. Reviews should not normally exceed 1,000 words. Please address all manuscripts and books for review to Shane Wallace, Department of Classics, Arts Building, Trinity College Dublin, Dublin 2, Ireland (swallace@tcd.ie). 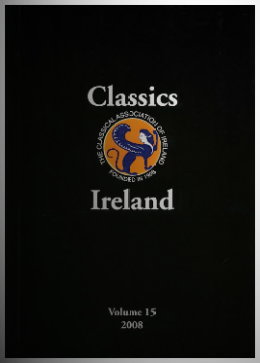 Classics Ireland is available in both print and electronic form. Previous issues are available on JSTOR to subscribing institutions and individuals (lt http://www.jstor.org/journal/classicsireland). If you would like to subscribe to Classics Ireland please contact the membership secretary, Prof. Andrew Smith (andrew.smith@ucd.ie), or the editor, Dr. Shane Wallace (lt swallace@tcd.ie). Catherine Ware (University College Cork).